^ Lambourne, L. Victorian Painting. Phaidon Inc Ltd. 1999: 285. ^ No. 25551. London Gazette. 22 January 1886: 328. ^ No. 26705. London Gazette. 31 January 1896: 587. ^ Cornucopia 10, Ingres and Lady Mary Montagu, Leighton House, yurts, the Lycians plus elegant eggplant. Cornucopia.net. Retrieved on 2011-02-20. ^ LEIGHTON, FREDERICK, LORD LEIGHTON (1830–1896). English Heritage. [2012-07-01]. ^ Lord Frederick Leighton Biography. 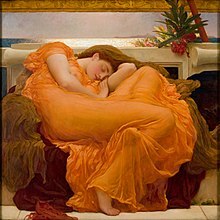 frederic-leighton.org. [19 May 2013]. ^ Lambourne, L. Victorian Painting. Phaidon Inc Ltd. 1999: 288. ^ Lambourne, L. Victorian Painting. Phaidon Inc Ltd. 1999: 448. ^ Frederic, Lord Leighton | Cimabue's Celebrated Madonna | L275 | The National Gallery, London. Nationalgallery.org.uk. Retrieved on 2011-02-20. ^ Tate Collection | Study for `The Discovery of Juliet Apparently Lifeless'. Tate.org.uk. Retrieved on 2011-02-20. ^ Frederic, Lord Leighton | The Villa Malta, Rome | L851 | The National Gallery, London. Nationalgallery.org.uk. Retrieved on 2011-02-20. ^ Artwork Page: Actaea, the Nymph of the Shore 页面存档备份，存于互联网档案馆. Cybermuse.gallery.ca. Retrieved on 2011-02-20. ^ Tate Collection | An Athlete Wrestling with a Python by Frederic, Lord Leighton. Tate.org.uk. Retrieved on 2011-02-20.